Iron is high maintenance and hence expensive in the longer run. Even the installation costs and procuring the materials will be dearer than stainless steel and glass railings. There is truly no rationale in spending more upfront and spending more over a period of time while there is another, better looking and more affordable choice. You could compare glass railings with wrought iron and still the former would have a distinct advantage. Take the simple issue of having to clean all the pickets one by one and just wiping a large panel of glass. Glass railings can have one or several panels. Iron railings can have a dozen to hundreds of pickets. Glass panels can be cleaned with one broad wipe. You cannot use the same technique for iron or even wrought iron pickets. Time and effort are two of the three most important demands of any maintenance, the third being money. 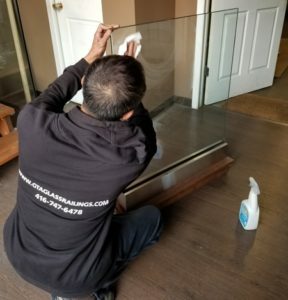 You would definitely save time and put in a fraction of the effort in cleaning glass compared to cleaning iron railings. The cost too will be significantly lower because you wouldn’t have to deal with the extensive weathering that is common for iron. Stainless steel and glass railings would not have any rust problem. Corrosion of any kind is unheard of. There is no need to touch up the materials for cosmetic enhancement. All you need is a cleaning agent to get rid of any smudges or dust that may have accumulated on the glass. It is not so simple in case of iron. It is unlikely you would have iron in an untreated form. The metal would be treated with one or more coatings. One could be purely for aesthetic purposes and the other could be for resistance against the weather. These coatings will wear out as well. You would need to reapply these coatings from time to time. That will cost you money, time and effort. Glass railings don’t need any such re-coating. You can simply polish the glass surface and it would retain its splendor.